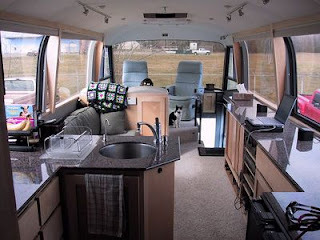 I want to direct those of you who aspire to a more mobile lifestyle to the blog of Sean Welsh and Louise Horner, who have been full-timing it in their Neoplan Spaceliner bus for the last several years. 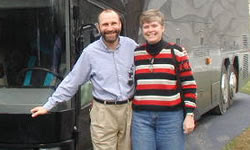 Sean and Louise worked the hurricane relief circuit in New Oleans and wound up doing some flood relief work up on the East Coast soon thereafter. Following that they meandered down into the Copper Canyon region of Mexico where their bus was first loaded onto a railroad car and then later loaded onto a ferry for the ride over to Baja. Currently they are in the Pacific Northwest having some work done. They are motorcyclists (Odyssey has been reconfigured to carry two motorcycles internally) and enjoy spending their leisure time hangin' on Mexican beaches, so right there they are fine people as far as I am concerned. 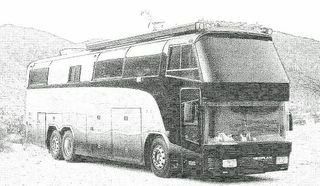 A word about their bus - Odyssey is a very rare Neoplan Spaceliner. Neoplan is a German manufacturer that once had an assembly plant in Colorado. 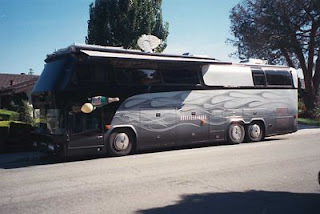 Most of the Neoplan production in the USA was for more conventional buses but the Spaceliner is a high powered over-the-road bus meant to be a deluxe first-class bus for German service. It's not quite a double-decker so think more in terms of the Spaceliner as being more of a deck and 3/4's. Typical layouts of the Spaceliners had the driver and a stewardess in a compartment in the low front of the bus and the passengers were upstairs. In Sean's converted Spaceliner the front window glass offers an unobstructed view because the driver's compartment is sealed off and directly below the living space. The Spaceliner is a bus that has intrigued me for years. When the time came to start planning our transition to full-time RV'ing we looked at a couple of them but just felt that, as beautiful as they are they are simply too exotic and too high maintenenace for our purposes. Beautiful buses however, and it's wonderful to see Sean and Louise step up to the plate and accept the challenge. They have done well reconditioning and maintaining Odyssey. Enjoy Sean and Louise's blog. They certainly keep themselves busy and are living what would seem to be the ideal lifestyle for folks with a wandering soul. Hey, John, thanks for the nice post about us. And more importantly, thanks for your support of the Red Cross. Looks like we have a lot in common: buses, motorcycling, publishing and disaster relief. Hope to run into you on the road one of these days.